This is a thread where you can post your finds of unique clothing/accessories/whatever that you want, find inspiring, etc.. I'm about to go into town to buy those Hareem Trousers. I decided I ought to try them on since they could easily make my bum look even bigger than it ought to when wearing Hareems. Edit: Swindon did not have the Hareem trousers. The girl I asked did not even know how to spell Hareem trousers. I need to get out of this town. Also, I was about to buy those boots because at £17 they're pretty cheap. But then I go to checkout and they've stuck me with £4 worth of postage and packaging and suddenly £20 doesn't sound cheap anymore. They should put the p&p inclusive of the original price so I know what I'm actually supposed to be spending, so I don't get over excited about having lovely boots. 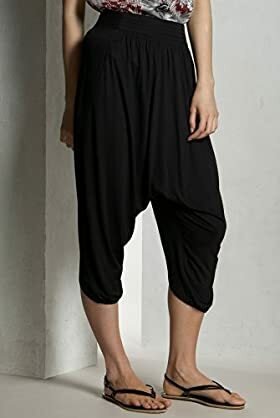 I've got some cool trousers like those but they're long and baggy, but you can pull the bottoms together to look like genie trousers! I love them. Haha give into it, Queenie! it think they should fit your body perfectly and because of the shape would make you seem skinnier...I like them. Alright so I went to buy them, but then they tried to charge me £11 for p&p! Um, No! I'm going to try and make them myself. I need a heavyish stretch fabric though. Can anyone think of one? And yeah, I kind of need high waisted things. I have a really small waist to hip ratio and I want to show it off but thanks to how ridiculous the ratio is (I'm 25 inch waist, 38 inch hip - any people making comments about my big bum will be asked to leave the room) I can never find high street high waisted stuff that fits my waist properly. These would've been perfect! Alas! Look what I bought! Just look! 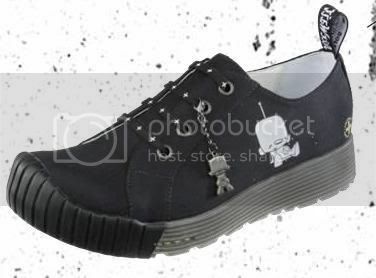 nicest shoes ever! They're sooo cute.